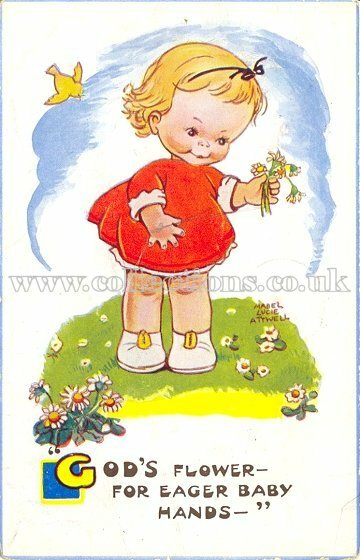 Title: 5646 - "God's flower - for eager baby hands -"
Publisher: All Genuine Attwell Postcards Have The Artist's Signature Thus:- (shows example of signature) 5646. "Dear Barbara, I hope you didn't get too excited about the good news. Daddy and I are so thrilled at the thought of having you home soon. See you this afternoon. all our love Mummy & Daddy"